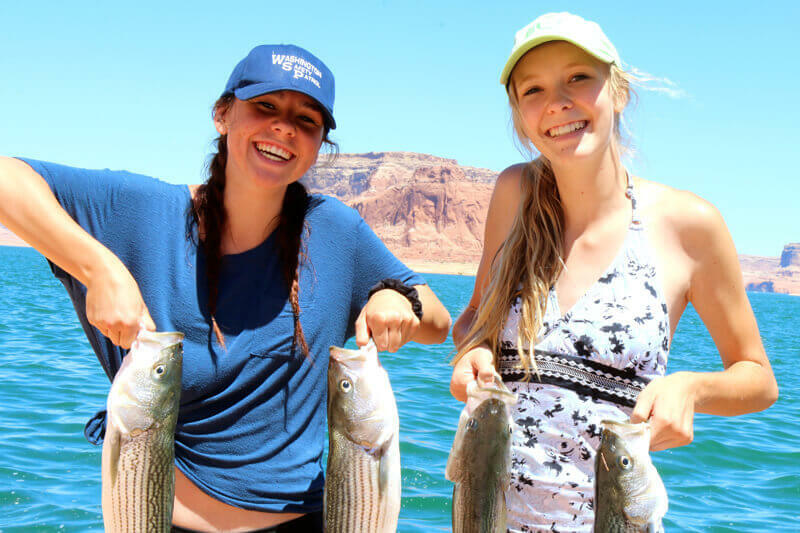 BAIT IS BEST — Right: Megan Sparks and Aubry Calkins, St George, Utah, really enjoyed fishing for stripers with bait at Buoy 25. Bait fishing is once again the best choice. July 5, 2017 – Lake Powell fish are in awe at the brushy cover inundated along the shoreline. Virtually any place that is not a sheer cliff is now a brushy haven for all of Lake Powell’s fish. Those enjoying cover the most are shad. Normally this time of year, defenseless shad are easy targets for stripers and other fish. Now shad can go hide in the brush making it much tougher for predators to get an easy meal. I am happy as well because this gives me hope that shad will grow to a larger size, in larger numbers which will lead to big striper boils in late July and August. This will be a story for a future report. Right now shad are happy in brushy cover and game fish are trying to figure out what is going on! Stripers were thrilled to have slow moving tiny shad in open water where they could just go get an easy meal any time of the day. Now shad are able to swim and have high-tailed it to the brush line. Surface feeding action that was easy to see two weeks ago is now missing in action in the southern lake. Striper slurps still continue in the northern lake where shad numbers are higher and muddy water slowed the progression of shad movement to brush. Warm surface water and lack of open-water shad have made bait fishing in deep water the most effective fishing technique now for stripers. Adult stripers are hungry and trapped down at 30 feet waiting for food. Main channel and main canyon walls anywhere on the lake can house a hungry, waiting school of stripers. Chumming and bait fishing may be the best way to approach these waiting fish. Another option is to troll deep diving lures along slick rock points and steep walls. Trolling is a good way to find a school of fish. Once found, bait may work better but it really depends on which angling technique is preferred. Smallmouth bass prefer rocky structure but are not afraid of brush. They have followed shad into the underwater jungle and can be found searching through the limbs and branches for a shad or sunfish. Small topwater lures, swim baits, D-Shad, and weedless plastic baits fished along brushy main points have been very effective. Watch for shad schools to pop up in the brush line and then toss a surface lure near the shad school to target any game fish also eyeing that school. Largemouth bass will be right there rubbing shoulders with smallmouth bass. Largemouth tend to prefer brush thickets in shallow water. They live in the same brushy condo as sunfish. Bass are good neighbors most of the time but occasionally eat one of the sunfish when the time is right. With a full stomach, largemouth return to being model citizens and continue to live in the brush pocket. Walleye really like brush. They are an ambush feeder so they move to a submerged tree top and wait for the right fish to swim by. Walleye are happy to eat shad, sunfish, bass or any other fish that enters their treetop target zone. One great technique for catching walleye in brushy water is to troll or cast a shad imitating lure just over the treetops where walleye are holding. We caught a walleye on a surface lure last week in a tree top found in murky water. More commonly a lure trolled just over the tops of a band of submerged trees is the best technique. Find trees that are at a common depth, then use a lure that runs about a foot above the brush for best results. Catfish are really big and fun to catch this year. Sunfish are in the trees and like to eat worms on a small hook with a bobber attached. Lake Powell fishing in the brush is unusual and may be challenging for those of us used to snag-free open water. The rewards are great when a new successful presentation is discovered. Lake Powell has lots of fish to catch. Sometimes trying new challenging techniques, like fishing in shallow brush, can be very rewarding. At press time, lake elevation was 3635 and water temperature was 77-84F.